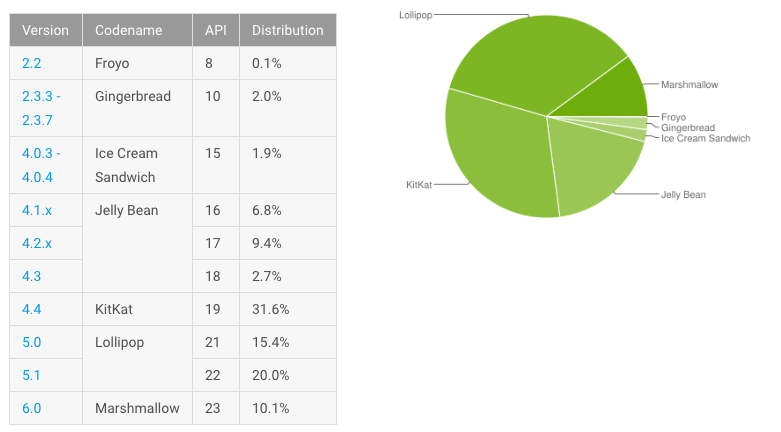 Google’s Android Developers released their latest survey of Android versions running on mobile devices. Marshmallow has been growing at a nice clip in recent months as smartphone manufacturers finally start getting the update out to their devices and new devices hit the market with Marshmallow out of the box. Marshmallow managed to hit a milestone with the survey that just concluded on June 6, 2016, by breaking through the 10% mark, but just barely at 10.1%. The Lollipop share of the pie remained largely unchanged compared to May numbers, still holding at 35% and some change. KitKat has dipped below 32% in June while Jelly Bean has dropped below the 20% mark to only hold 18.9%. Older versions like Froyo, Gingerbread, and Ice Cream Sandwich continue to hang on with mere slivers of the market.